I’ve been excited about the possibilities of Thunderbolt on the MacBook Pro since it was announced almost a year ago. The problem has been the wait to get these new small portable but fast peripherals. In a recent fxguide rc podcast, Jason and Mike commented about the delays in seeing products actually shipping. Due to various factors, including a lack of controller chips, Thunderbolt devices have taken a while to materialize. But we’re starting to see some cool products come to market that are especially suited to production and post production. A few of our favorites include the Echo ExpressCard/34 Thunderbolt Adapter and the LaCie Little Big Disk. These fit in nicely with our needs of nimble production travel for fxguide and fxphd, where we shoot with the RED EPIC, SCARLET, and the 5D. Why do they fit in nicely? Basically it’s the size/weight and the vast increase in speed. Our requirements for the job at hand are probably quite different from others’ needs. For our production, we’re already lugging quite a bit of gear around the world, so we don’t want to be bogged down with weighty RAID systems or even desktop-sized external drive enclosures. We have several Promise Thunderbolt RAID enclosures and love them. But the thought of lugging one around in a backpack? Ain’t gonna happen. So on the road, we prefer smaller and more portable notebook-based external drives such as the OWC Mercury Pro Elite Mini, which has FW800 and ESATA ports. We even steer towards larger capacity drives that spin at 5400RPM vs. smaller capacity at 7200RPM. This is because we’re shooting a lot of content on the EPIC and so we can quickly fill up drives during a week of production. We also stick with the 15″ MacBook Pro, as the 17″ is frankly too large to lug around (Mike and I have both owned 17″ systems in the past). But the 15″ MBP doesn’t have an Express Card slot, so until now we’ve been out of luck using ESATA drives on the road. This is why it makes sense that we love the Little Big Disk and the Echo Express Card Adapter. The Little Big Disk gives us 2TB of RAID0 speediness in an enclosure that fits in the palm of your hand. As far as the Echo Express Adapter, it allows us to plug in the Sonnet Tempo SATA Express 34 and then use the ESATA connection on the RED STATION. This allows us to take advantage of the vastly faster Thunderbolt pipeline as compared to FW800. Is a unix command-line copy faster than the Finder? The test involved transferring 40.5GB of R3D footage from a REDMAG SSD 128GB. Each test was run twice and both runs were incredibly close to each other (within 5 seconds). See the end of the article for a visual representation as to how the drives were hooked up for the various tests. The obvious takeaway was that using the ESATA adapter and the LaCie Thunderbolt drive gave us performance that was close to 2.5 times faster than the FW800 setup we were using at the end of last year. That’s a huge difference when you’re transferring footage overnight after an all day shoot. Interestingly, using the OWC drive as an ESATA drive in the same setup was also considerably faster. So if you need to use the single drive in a pinch, it’s worth it to use the ESATA connection. If you use R3D Data Manager to ensure the integrity of your transferred data, the results using the full on Thunderbolt system were fairly close to our “original” FW800 to FW800 Finder copy setup. It’s also more than twice as fast than if you were using R3D Data Manager with the FW800 to FW800 connection. We did find that occasionally we’d unmount the Thunderbolt attached drives (both the LaCie and the RED STATION) and couldn’t get them to mount again without rebooting. Unmounting and detaching and then re-attaching the Thunderbolt cables seemed to cause the swaps to be more stable. The Sonnet Tempo SATA Express 34 doesn’t solidly click into the Echo ExpressCard/34 Thunderbolt Adapter. Be careful as you don’t want to disconnect the drives during a copy. If you do, you’ll most likely need to reboot to get all the drives to be recognized again. The ReTrack Esata Adapter is a nice, compact ESATA adapter that winds and unwinds the cables. We find this to be a better solution than the incredibly rigid (and short) ESATA cables you find that are common. 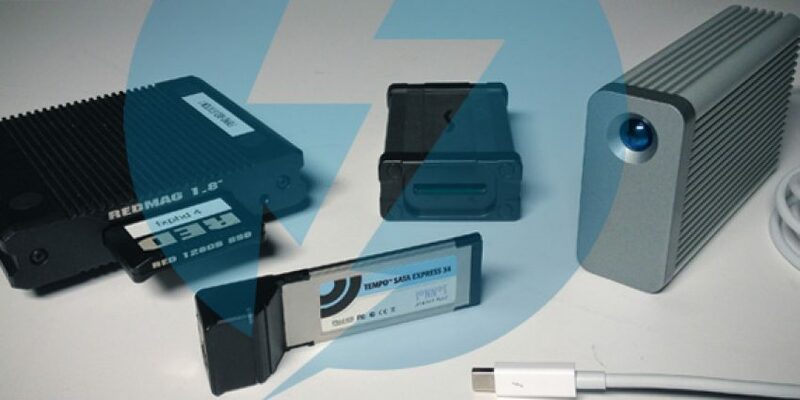 All in all we’re really excited about this first batch of portable Thunderbolt products to hit the market. Faster drives on the road equals more sleep (instead of staying up babysitting EPIC transfers), – or time for a few more pints of amber ale after the shoot. Great article. I’m a fellow Aussie Epic owner/ shooter and can’t wait till Red adopts Thunderbolt on the Red drives. If they could also make it bus powered…. even better. More speed, more portability = less luggage and even more beers. The Sonnet Tempo SATA Pro ExpressCard/34 is quite a bit faster than the non-Pro card. I wonder if the eSata drives would be any faster with the Pro card? I wonder if the computer used has any influence on the data rate? On the road a MacBook Air 11″ would be perfect but not sure if thunderbolt relies on the computer in anyway? Great Post By John … Like Always 🙂 mike and john are awesome …. Thanks for the post! I am currently using this setup with a MacBook Pro 17. Instead, however, I use a single-port eSATA card inside the laptop, which can read a RED SSD at 180MB/s, and the Echo Expresscard / Sonnet Tempo connecting two transfer drives. Shaves a small chunk of time off again when using R3D Data Manager. This is great, thanks John. My problem is that I use my laptop for everything. This setup is great for the road. But all i need at home is the the sonnet thunderbolt adapter (an OWC drive in one esata port and a red station in the other) and a monitor. My question is, how can I connect a monitor with that setup as i have now remaining thunderbolt/display port? What I really need is a thunderbolt splitter. so did you find if the unix cp command was faster than copying with the Finder? i also wonder if the command ever makes us believe it finished when the data is stil buffering, meaning that you’ll lose data if you disconnected or shutdown. Thunderbolt drives is introduce nice product. External drives are very useful source for data storage and can move and attach to another system and transfer data. It is also helpful to move heavy data file from one system to another.